Bethany Homecrafts Upcycled Designs: I Saw A Pileated Woodpecker!!! Like many birders, I keep a life list of the birds I've spotted (mine's not very long). 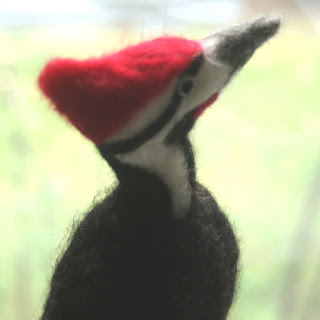 I was very excited to see a bird on Friday that I'd never seen before - a pileated woodpecker. It was massive! Sitting at the top of a rotted tree, hammering away and making a huge noise, I knew this was a new one. I didn't get to see all of the markings, but definitely enough to make the identification. So of course I had to come home and make one. 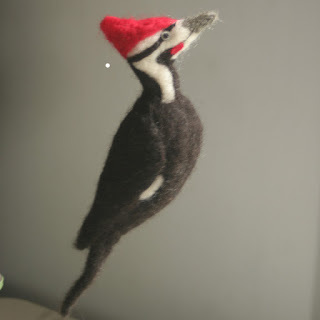 I started him on Saturday while I was at the Audubon Earth Fair - I thought that was fitting! I had a lovely day there, clear blue skies, good music, great people. It was a wonderful start to my outdoor season.